Welsh ministers are frustrated that the UK government has not accepted more of their help before Brexit negotiations, Wales' finance secretary has said. 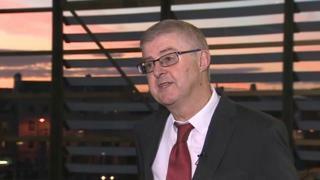 Mark Drakeford said UK ministers must show they can both listen to devolved administrations and accept assistance. He told BBC Wales he wanted to ensure the prime minister got a good deal for both Wales and the UK. First Minister Carwyn Jones has repeated his call for all four UK parliaments to ratify the deal. Theresa May triggered the two year process for the UK's departure from the European Union, on Wednesday. Speaking to BBC Radio Wales' Good Morning Wales programme on Thursday, Mr Drakeford said: "We want Mrs May to succeed - that's where the Welsh Government starts from. "There's a job of work for the UK government to do to demonstrate that it is listening carefully to the devolved administrations but to also be willing to take the help we can offer. "Part of our frustration throughout is that there is more that we could have done to help shape the way the UK goes into these negotiations." He spoke before UK ministers' published their white paper on the Repeal Bill, in which Brexit Secretary David Davis promised a "significant increase in the decision-making power of each devolved administration". The legislation will give the UK government the power to decide which EU laws - totalling more than 19,000 - should be kept or rejected when the UK leaves the European Union. In her letter to European Council President Donald Tusk, beginning Brexit negotiations, Mrs May said Wales could expect a "significant increase" in devolved powers following Brexit. Mr Drakeford said: "We have been absolutely clear that agriculture, fisheries, the environment and so on, that those powers already lie in Wales. "When the EU is gone, those powers haven't gone anywhere, they will still be here where they have been since 1999. "Our anxiety is that there are some people in the UK government who appear to believe that without the European Union somehow those powers are floating free and they will hang onto them and then say they'll hand them to us - they already lie with us." Welsh Secretary Alun Cairns said the Repeal Bill would offer devolved administrations the opportunity to extend their powers. "We've been absolutely clear... no decisions that the Welsh Government or any of the other nations or devolved administrations take at the moment will be removed from them," he said. Article 50: Where do Welsh parties stand on Brexit?